Vitiligo is a condition that causes the skin to lose its natural color. Patches of lighter skin appear, and there can be a small number of fair colored spots or widespread loss of skin color. Vitiligo can affect any part of the your body; any area of skin can be affected. When the scalp is affected, sometimes a section of hair can turn white. Some people lose color inside their mouths. Even an eye can lose some of its color with this condition. In vitiligo cases, the body attacks its own melanocytes, which are the cells that give our skin, hair and body parts color. It is still unclear as to what causes this color loss, but it is possible that the condition is an autoimmune disease. The condition is not contagious or life threatening. However, it is important for someone with vitiligo to seek the care of a dermatologist; a person with vitiligo has a higher risk of other medical conditions, and sun exposure is a major concern. Additionally, there are other conditions that may cause light spots on the skin, so a proper diagnoses is necessary. 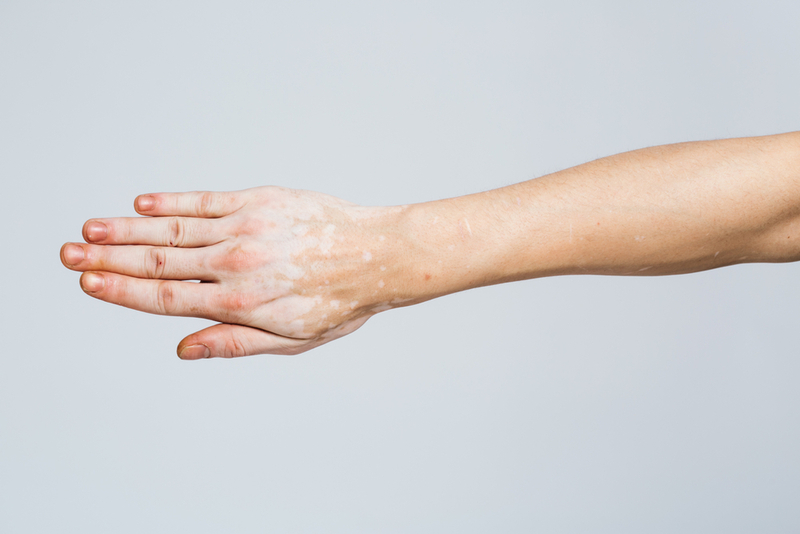 There are many cosmetic considerations that come into play with vitiligo, and our cosmetic office can help you address them.